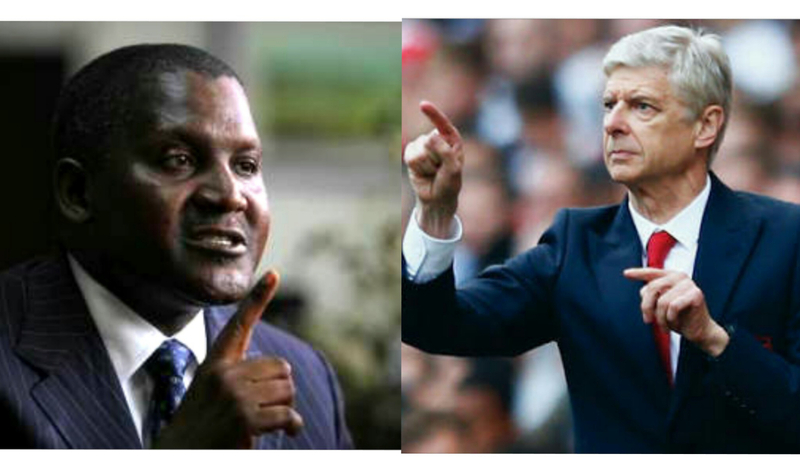 Business tycoon/Arsenal lover and richest man in Africa, Aliko Dangote, who has in the past hinted plans of buying Arsenal club has come out to say he will change Arsenal’s current coach, Arsene Wenger, when he buys the English club. He revealed this in a recent interview with Bloomberg. FL- You’ve mentioned wanting to buy Arsenal Football Club before. Is that still on your wish list? Dangote: Yes, but I don’t want to go after Arsenal until I deliver the refinery. Once I deliver, I will go after Arsenal. FL – There are no other clubs you’d want to buy? Dangote: I don’t change clubs. Even when Arsenal isn’t doing well I still stick by them. It’s a great team, well-run. It could be run better, so I will be there. I will wait. Even if things change I will take it and make the difference going forward. FL – Do you think Stan Kroenke and Alisher Usmanov would sell their stakes? Dangote: Well, you know anything is possible in this world. If they get the right offer, I’m sure they would walk away. We’ll be in a position to give them the right offer. They will not hold ­Arsenal forever. Someone will give them an offer that will make them seriously consider walking away. And when we finish the refinery, I think we will be in a position to do that. FL – How would you change things? Dangote: The first thing I would change is the coach. He has done a good job, but someone else should also try his luck. FL – If you were playing for Arsenal, would you be a striker, defender, goalkeeper, or the manager? Dangote: I would rather be a striker. Naturally, I’m an aggressive person. I don’t want to be part of the support team. I want to be the one scoring the goals. FL – When did you start loving the club? Dangote: In the mid-’80s. I was introduced to a man named David Dein, who was Arsenal’s vice chairman, through a friend of my uncle’s. He was the first person who showed me a cargo of sugar in 1980, when I started importing. I started buying sugar, and he started taking me to the stadium. FL – Just wondering: Would you ever run for president? You’re still young. Maybe in 10 or 15 years? Dangote: No, I’m not interested. There’s quite a lot we can do from the business side. I enjoy a lot of what I am doing, and I also love my freedom—and I don’t have too much. The little I have, politics would take away. I am not ready to give that up. There are businessmen who are interested in politics. I’m not one of them.